All your documents available and up to date - in real time! List of documents summarized on your page. Filter your data according to your criteria, the result is instant! Easily select items from your own catalog - or more, just build it as you type. Professional invoices and estimates designed for you ! 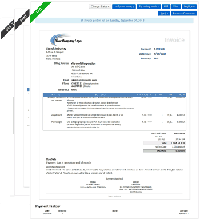 Beautiful invoices and estimates can improve the way you do business and finally get paid! Using professional design, your clients will see you as a serious person they can trust. Choose various styles, with different fonts, colors and place your company's logo. Automatic reminders will send a message directly to your clients to remind them for non-approved estimates or non-payment invoices. We do everything for you, no need to chase them anymore. Just forget how your client pays you ! You are notified by email and/or SMS.